Hillarychild's Weblog | Need happy passion? Such an arduous task some days. Feeling out of my depth I drown my feelings of inadequacy in the foam of my caramel macchiato, stare out the window and let my mind wander. The sun sets among a canopy of yellow-brown leaves; making me wish I had a better vocabulary for color as “yellow-brown” does little to denote the excellent dichotomy of their vibrant death. The inaccurate, cliché comparison would be to that of a soldier, dying valiantly on the battlefield. But the very idea of it is so absurd it almost makes me laugh. These leaves feel no pain, nor do they knowingly give their lives in an effort to improve the world they leave behind. No, their lives are short and predetermined and in the end there is little more glory to them than to the mayfly that lives just long enough to eat, mate and die. 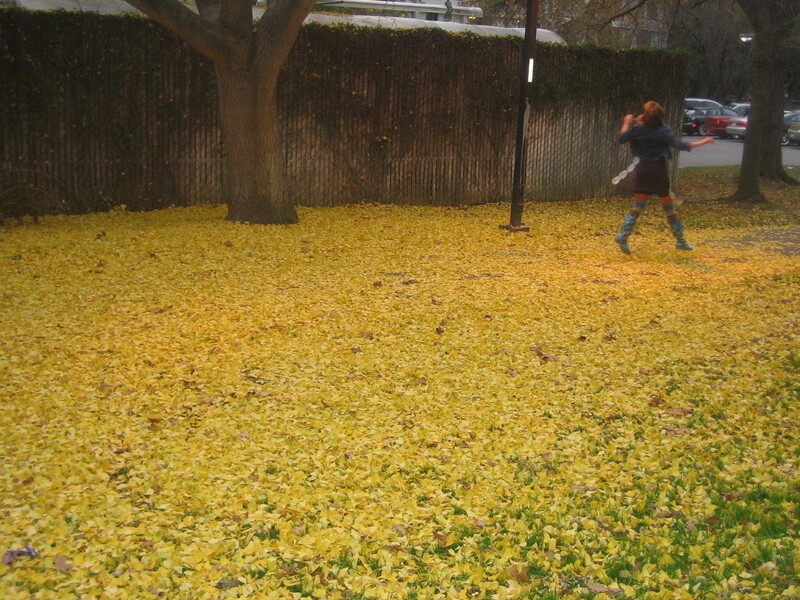 Perhaps mayflies would garner more respect if they went out in blazes of yellow-brown glory. Bright red salvation hath found me. Like a Rorschach test on cotton. The beauty of bodily destruction. Oh, blessed ache of empty space. There’s nothing here but me. Translation: His little death did not lead to my little life. ~When I can no longer simply rake it in I’m forced to go out and work my hoes. Being one step closer to paying my rent next quarter. ~Come on Sophia’s, you know you can’t help but want me despite my utter lack of previous job experience. ~And the three minutes I save by not having to put it up before dance every other day. I’m a creature of habit. I take comfort in, and derive direction from, a sense of normality. As such, missing my first class of the morning in favor of a wild goose chase for apparently miswritten office hours resulting in my finishing a strange Chuck Klosterman novel about an absurdly amoral man who smokes an awful lot of PCP is…odd. It puts me in a weird head space. And, because of this, I will continue to view my day as strange, surreal, even. Maybe I will take an upper division Russian class next quarter. College is…trade offs. It’s more freedom with less stability. The opportunity to eat S’mores Poptarts, unhindered by anything but my slightly pretentious ethics teacher, but no place to toast them properly. It’s a growing number of quiet places to study coupled with a diminishing expectation of peace in my own room. And paradoxes… A longing for familiarity on my quest for adventure. Avoiding the social scene because I’m too busy e-mailing. Studying for hours and feeling behind. I think it’s more exciting than I’ve made it out to be though. Yesterday, I played accomplice to a tree climbing adventure, read about “coffee shops” (drug dens) in the Netherlands, climbed to the top floor of the library and attempted to pick the lock leading to the roof, then resorted to playing tag amongst the book shelves and reading My Life Is Average when the lock picking proved fruitless, tried pumpkin cheesecake ice cream before dinner, attended the latest showing of “Whip It” and was the last person to leave the theater as it closed. On an unrelated note: I just discovered a Bryan Knouse through a friend of a friend on Facebook. I realize Knouse is not an entirely uncommon surname but I still feel like I should know him. Babysitting. My Life Is Average. Today, I babysat a girl who is usually quite rude. She was not rude today. I did not spit in her milk. Today, I babysat a five year old who sharted. I do not get paid enough for this. Saturday, a six year old gave me a bead necklace she had made. It matched my dress. I’m wearing it now. A week ago, I was forced to chase a 220 pound Labrador through my neighborhood. She entered my next door neighbor’s house and when I followed her I found my attractive, 20 something, firefighting neighbor, shirtless. He did not attempt to stop the dog. Esther on Today has been …strange.